One of the Marvel Universe's newest Spider-people is now one apart of the Marvel Gallery lineup! Introducing Cindy Moon, the second victim of the spider that made Peter Parker Spider-Man. 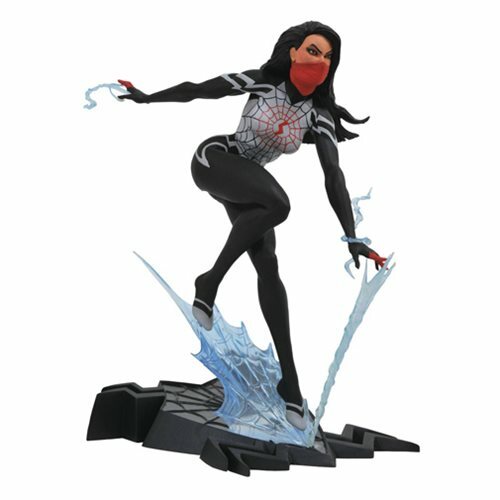 This stunning 9-inch statue features Cindy leaping into action and spinning a web on a spider-symbol base. Made from high quality PVC and sculpted by Alejandro Pereira, this Marvel Gallery Spider-Man Silk Statue comes packaged in a full-color window box and is in scale to all other Gallery and Femme Fatales figures.